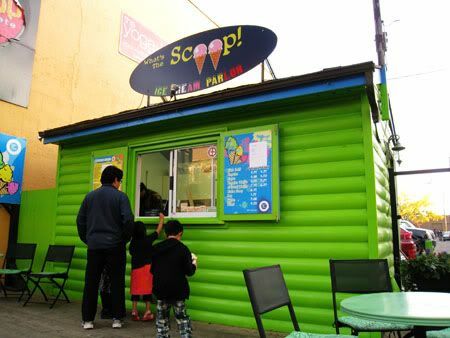 When I was a little girl, probably around 11-12 yrs of age, I remember there was always an ice cream shack situated somewhere around Whyte Ave & 104 St. Does anyone remember what that place was called? I took a break from studying this past Sunday to check out this little ice cream shop along Whyte Ave - the weather was too beautiful this past long weekend to keep me cooped up and studying all four days! During the summer months, they carry an amazing array of over 60 flavours, and are sure to make you salivate when you read them out! But come the fall months, they've reduced their flavours to 12 choices: bithday cake, black licorice, burgundy cherry, butter pecan, chocolate peanut butter, cookies & cream, kahlua chocolate fudge, mint chip, pistachio, tiger, vanilla, and lemon sorbet. 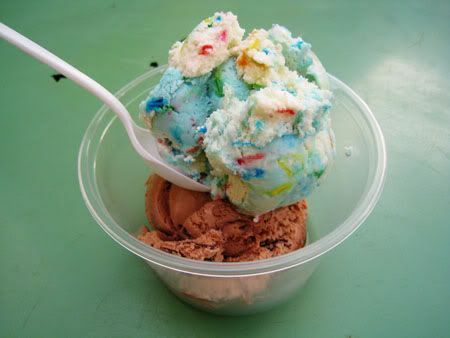 The cute little ice cream shop serves up Foothills Creamery ice cream - smooth, creamy, and always delicious. Its quite hard to miss as you drive by on Whyte Ave, with its lime green colour and all. I ordered a double scoop - birthday cake & kahlua chocolate fudge. 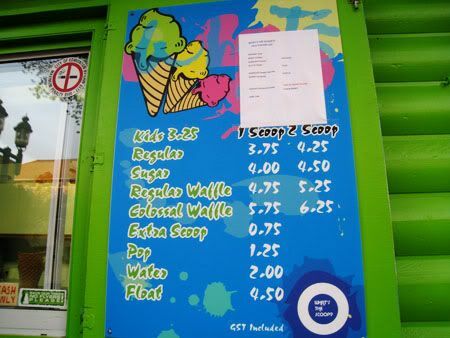 I was thinking it would be birthday cake flavoured, and white in colour, a la Marble Slab Creamery, but I was wrong! The Birthday Cake literally looked like a clown threw up a young child's birthday cake, in a good way of course. The unmistakable light blue icing, and chock full of pink and yellow sprinkles - it tasted just like what it was meant to be. Vanilla cake with lots of icing! I'm not too sure when this place will be closing for the season, as the colder temperatures threaten the start of Winter anyday now (I'm so serious.. Alberta weather is so unpredicatable!). But if you do happen to be along Whyte Ave and this place is open, do go try out their delicious ice cream! Loookkssss sooo goood! Did this replace Fat Frank's? Looks like the same shack! It's the in the same location as where Fat Franks used to be, but I think the shack is smaller! Good eye!